Hotel executive and Oklahoma state legislator elected to US Congress in 2006, succeeding Ernest Istook. Conservative Republican; anti-abortion rights, anti-gay rights, pro-gun rights. Supported 2008 Wall Street bailout; opposed 2008 GM/Chrysler bailout, 2009 economic stimulus, 2010 health care reform. 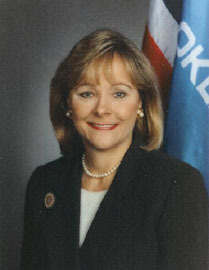 Elected Governor of Oklahoma in 2010, succeeding Brad Henry and succeeded in Congress by James Lankford. Campaigned for Governor promising to "push back against harmful and unconstitutional federal policies and defend our state sovereignty as outlined under the 10th Amendment." First woman elected Lieutenant Governor and Governor of Oklahoma. Crossings Community Church, a non-denominational congregation in Oklahoma City, OK.